Our first step was on a grape. Franzia is an American success story you can drink to. Our founder Teresa Carrara made the long treacherous journey from Italy to California to marry her betrothed, Guiseppe Franzia. This pint-sized little lady, standing at 4’11” planted her very first grape vines in Ripon in 1906. The newly married couple purchased eighty acres in the fertile growing regions of California’s Central Valley. This was the beginning of the Franzia wine making journey. Prohibition, boo! Who thought this was a good idea? Prohibition hit and the wine industry is greatly impacted. While many vineyards were going out of business, Giuseppe sold his wine grapes by the truck load in Chicago, allowing the Franzias to expand and purchased several farms. Giuseppe decided it was time for retirement and took a well-earned trip to Italy to visit family. While abroad, Teresa made a huge decision for the family and took out a loan of $60,000 to start Franzia Brothers Winery with her 5 sons. The Franzia Brothers Winery survived the Great Depression and slowly grew their business as the United States entered WWII. The matriarch, Teresa passed away in 1949; allowing her 5 sons to assume ownership of the winery. 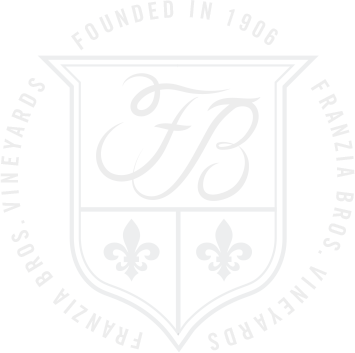 The Franzia Brothers continued to work together and perfect their wines to achieve a standard flavor that wouldn’t vary from year to year. By 1968, the company was the sixth-largest producer of wine in the United States. Producing 16 million gallons of wine per year. The company built a tasting room that would host numerous events. We’re still pretty proud of this: We came up with the first decanter wine bottle. Yeah, that was a good decade. We didn’t stop innovating. The 5L “Bag-In-A-Box” was born, along with the Winetap® technology to keep wine fresh within the new packaging. We remember exactly what we were doing when we learned we had become America’s most popular wine – we were standing around making wine, and producing more per year than any other brand in America. Really, our second century of winemaking isn’t that different from the first: We still honor Teresa’s legacy of quality, freshness, and value – we just don’t do it wearing turn of the 19th century clothes. In the past two decades, Franzia’s iconic Box has been redesigned….a few times. And we continue to deliver great new flavors like Dark Red Blend, Pinot Grigio, Pink Moscato, Rosé and Pinot Noir. We think – Teresa would be proud. Today, Franzia remains the World’s Most Popular Wine for 24 Consecutive Years by wine volume, continuing to make Franz around the world with a new design, on-the-go sizes and more delicious flavors. Ever do something you thought was really great at the time and then years later look back and go, “Man, what were we thinking?” Yeah, neither do we. So enjoy a timeless, endless hip stroll down memory lane as we look back on Franzia’s early advertising. These gems take you back to a simpler time when no one really lived like this – but they did enjoy Franzia wines just the same! You’re too young to remember, but many, many years ago, people READ things that were on paper! And the “click bait” was just ads. Here are our favorites.